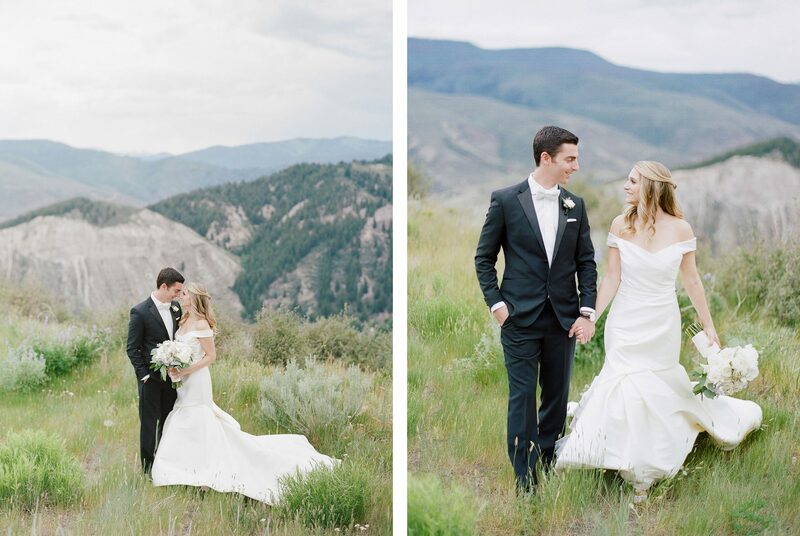 From the Photographer, Rebecca Yale: Lindsay and Steve were married over the July 4th weekend in a 5-day celebration in the mountains. 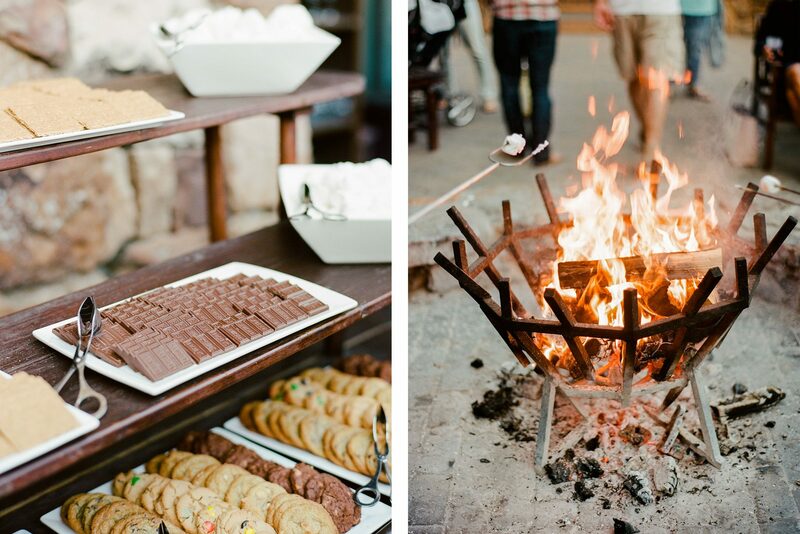 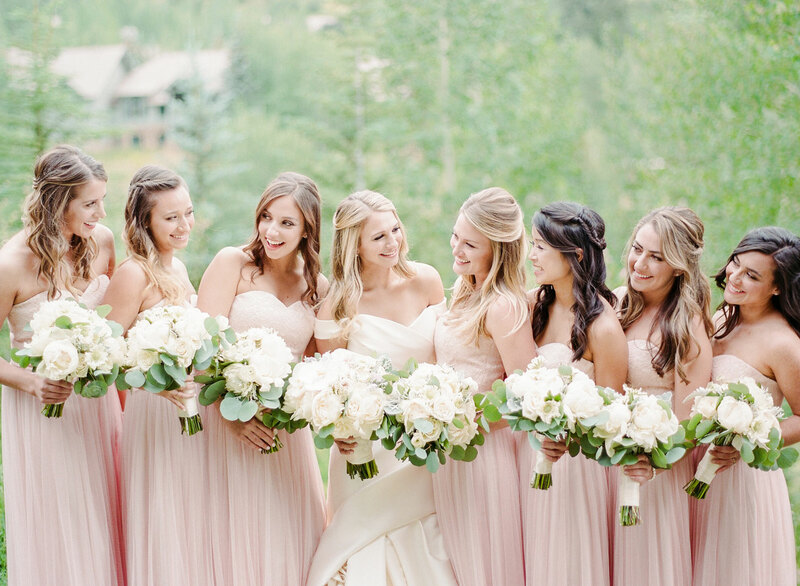 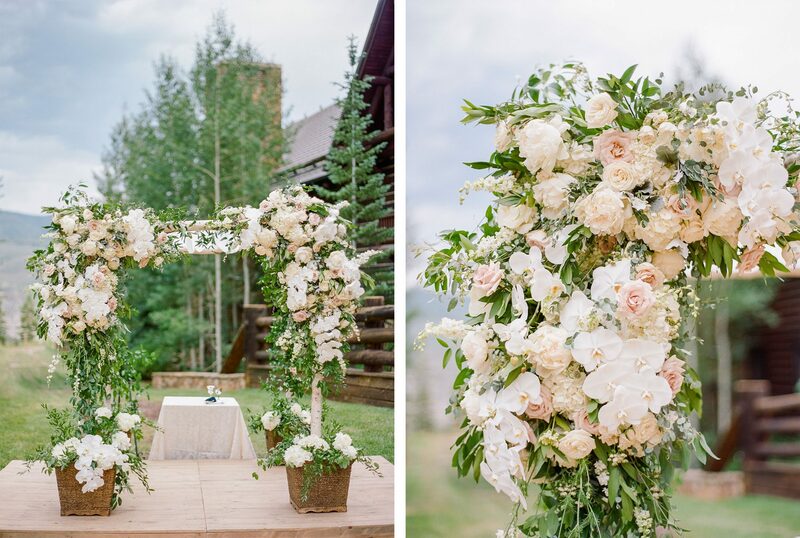 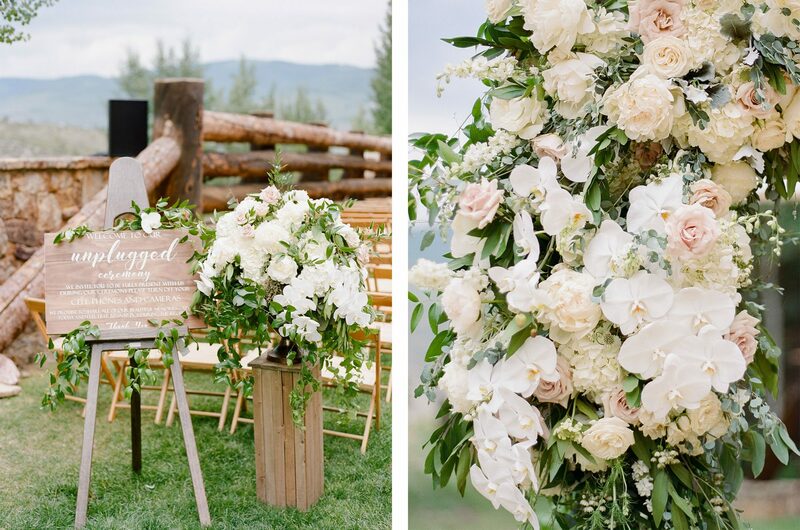 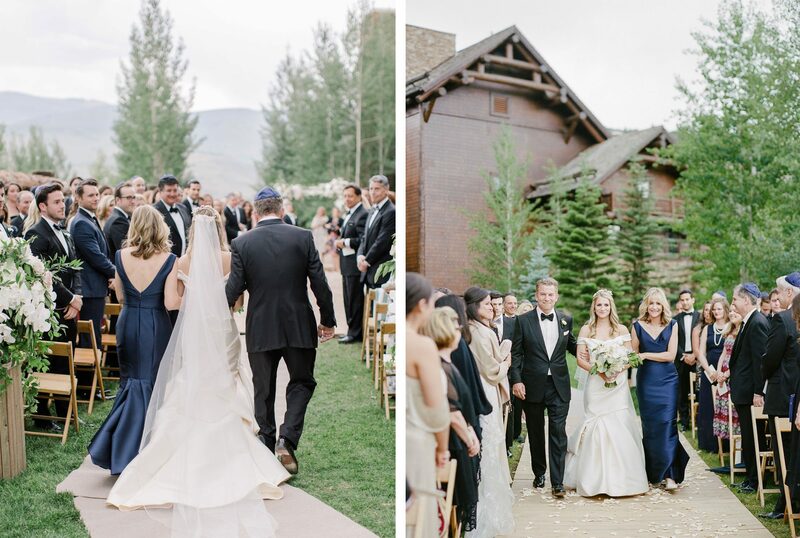 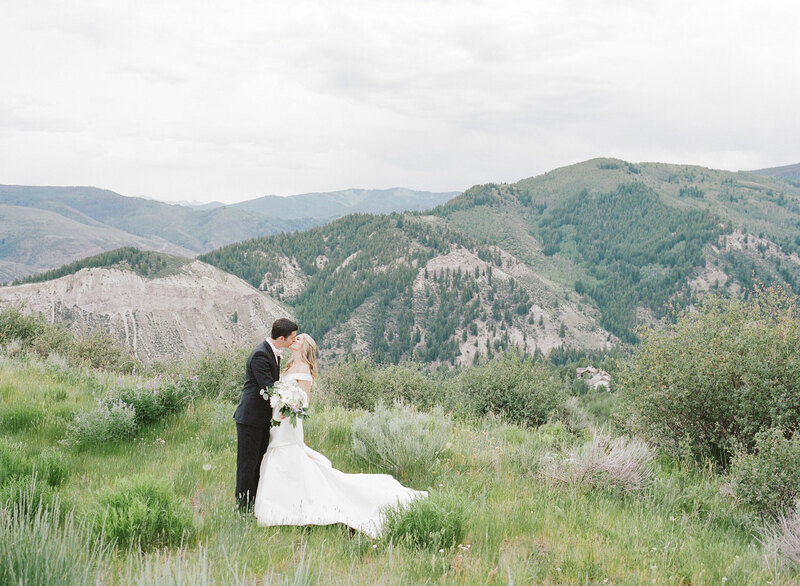 The bride’s parents have had a vacation home in Bachelor Gulch for years and knew instantly that the wedding would take place in their “happy place” with other events including a welcome dinner, bridesmaids hike and July 4th BBQ all taking place in the Beaver Creek area. 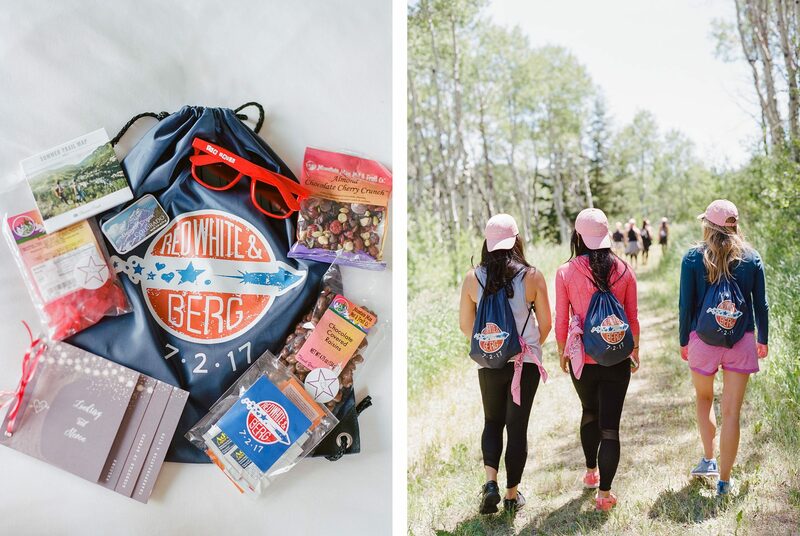 Each guest was welcomed to the Ritz with a personalized hiking backpack with the wedding’s hashtag “Red White and Berg” printed on it and full of local goodies from the area including the bride and groom’s favorite candy, red and blue sunglasses, trail maps and a program of the wedding weekend details. 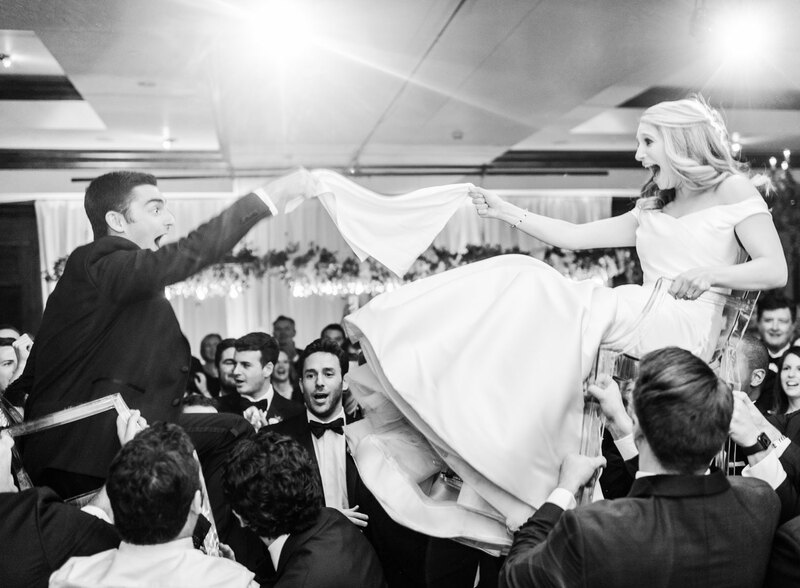 The weekend’s events ranged from casual to cocktail, but the wedding itself, set on the skier bridge and in the Ritz’s ballroom was black tie. 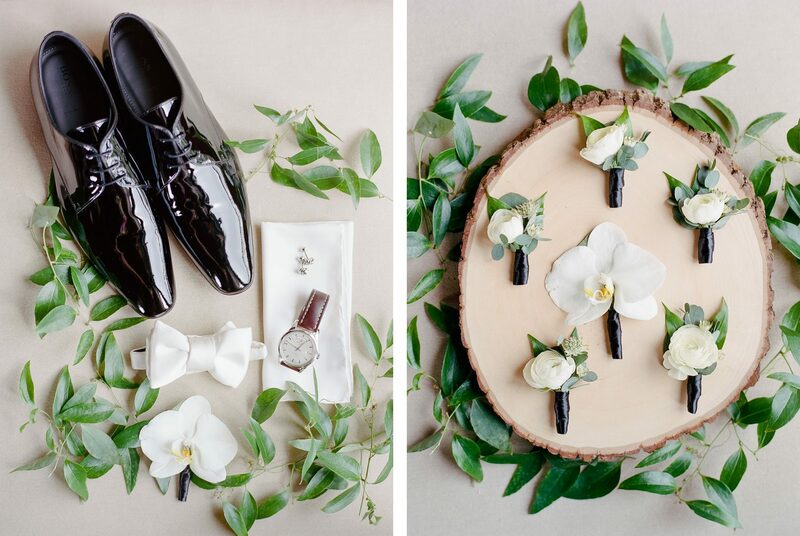 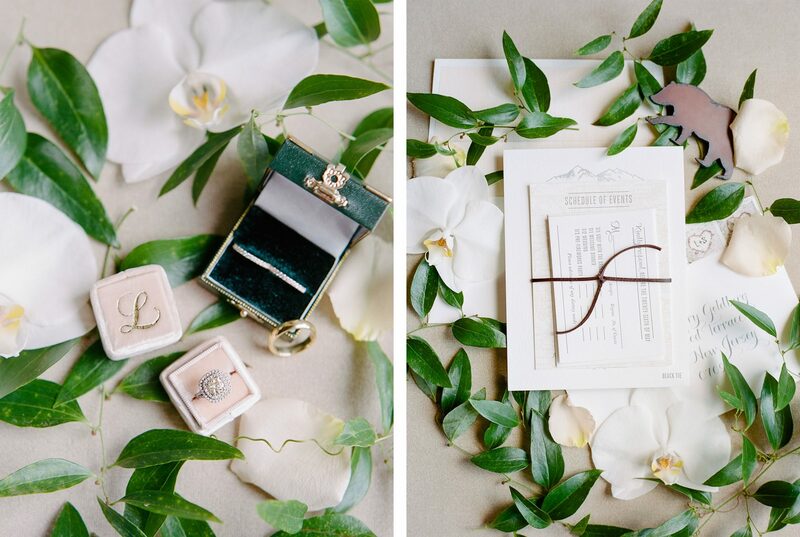 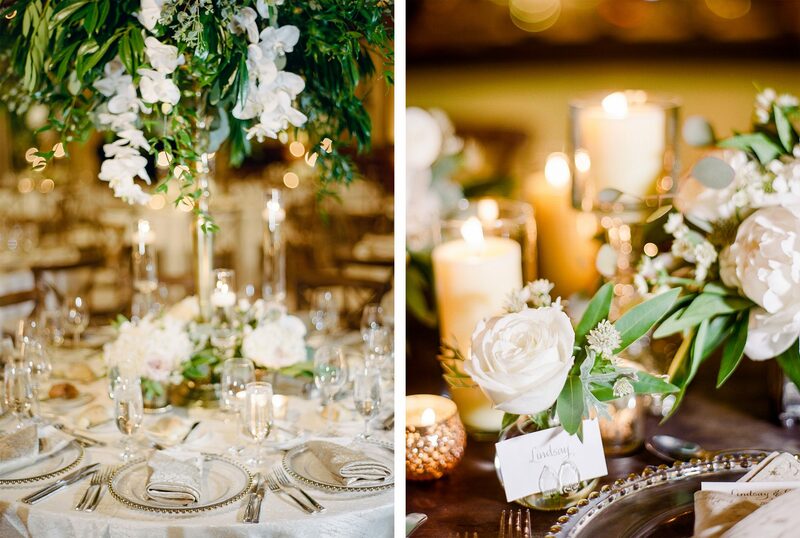 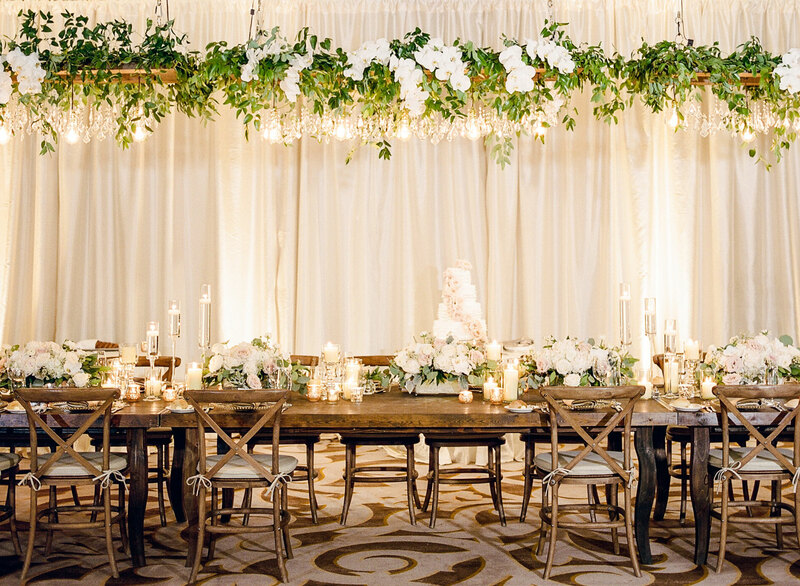 The couple wanted to bring in an unexpected floral combination using more formal orchids with mass amounts of loose greenery to bring the outdoors in and create a romantic woodsy aesthetic. 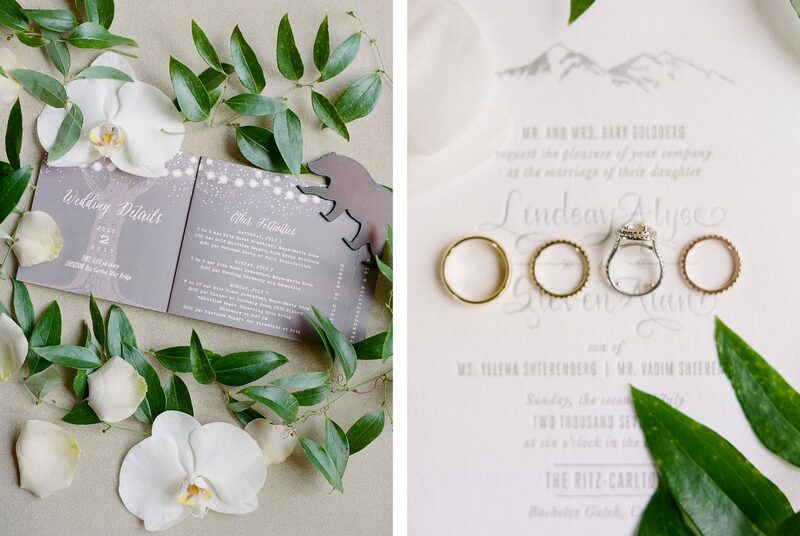 They kept their wedding invitation simple in tones of white and silver with a simple line drawing of the mountains and the bride’s mother found vintage map of the area to use as the backdrop for the schedule of events which was all bound together with a piece of leather. 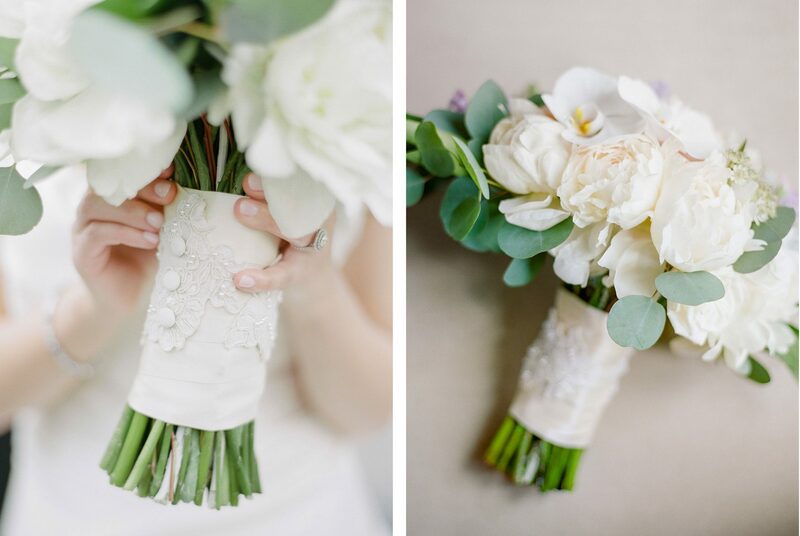 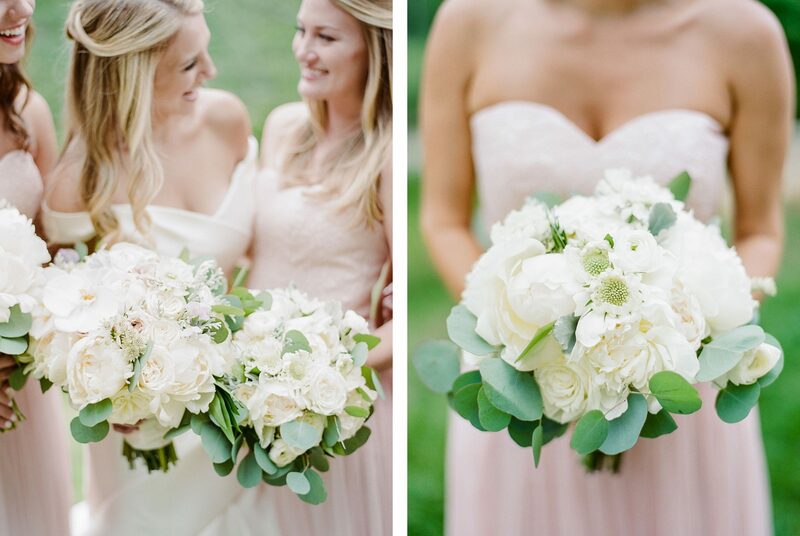 The bride’s bouquet was wrapped with a piece of lace from her mother’s dress. 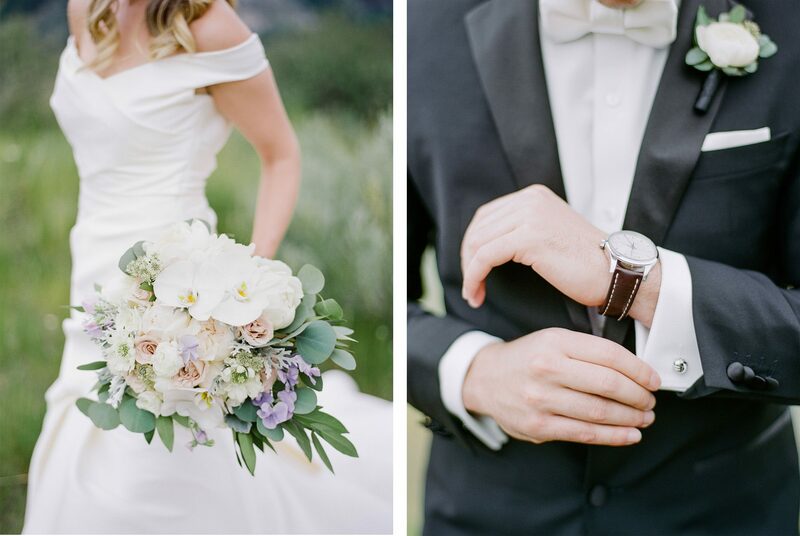 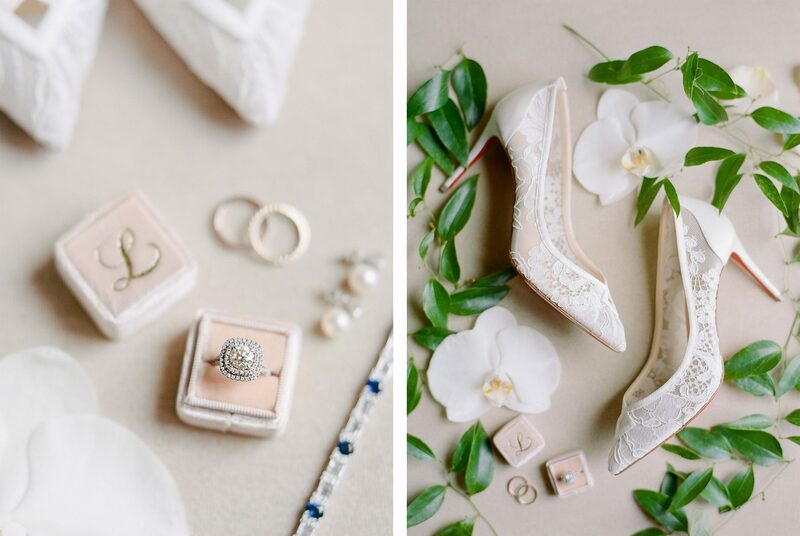 The bride wore a classic Monique Lhuillier ballgown, which she loved for the drama with the background of the mountains and paired it with delicate lace louboutin shoes and a sapphire and diamond bracelet leant to her by her uncle. 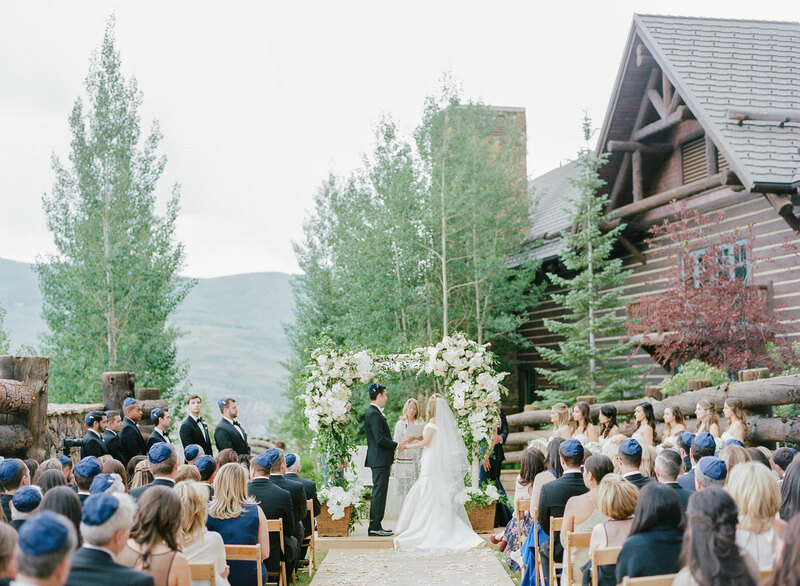 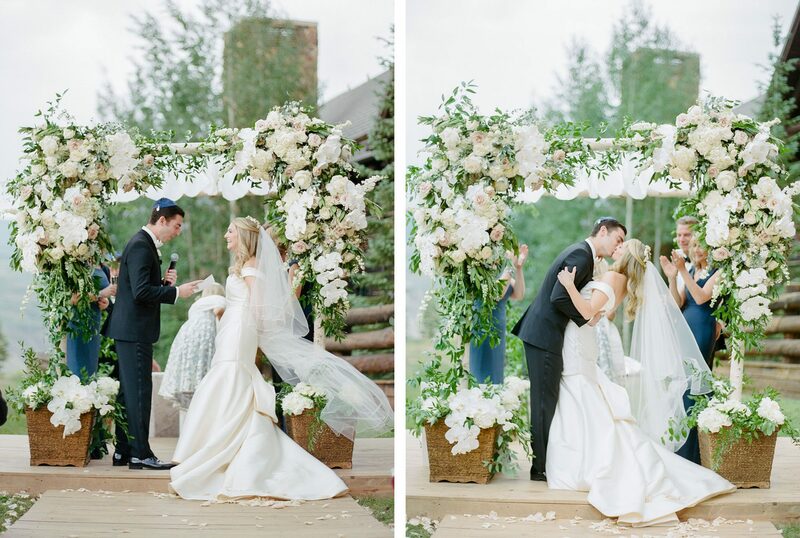 The ceremony took place under a lush floral chuppah on the skier bridge next to the resort, overlooking the mountains. 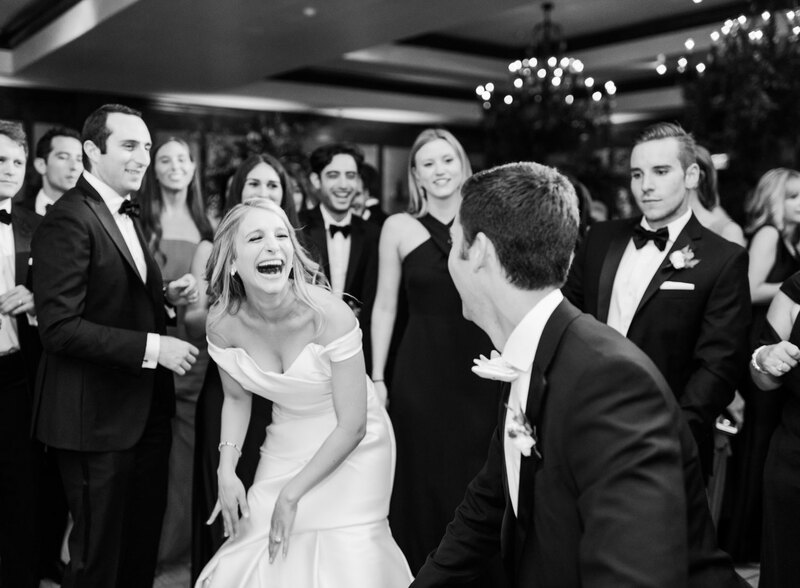 The bride and groom broke with tradition and elected to have a male and female usher to honor two of their dearest friends. 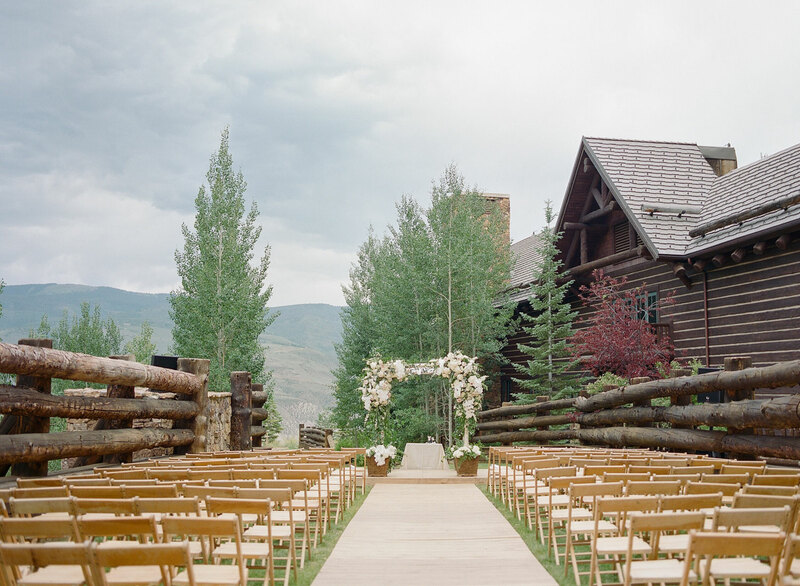 The forecast was clear for the day, but minutes before the bride was to walk down the aisle the skies opened up and poured rain for about 2 minutes sending all the guests running back inside, but luckily it was just a quick rainstorm and everyone was able to return back outside for the ceremony. 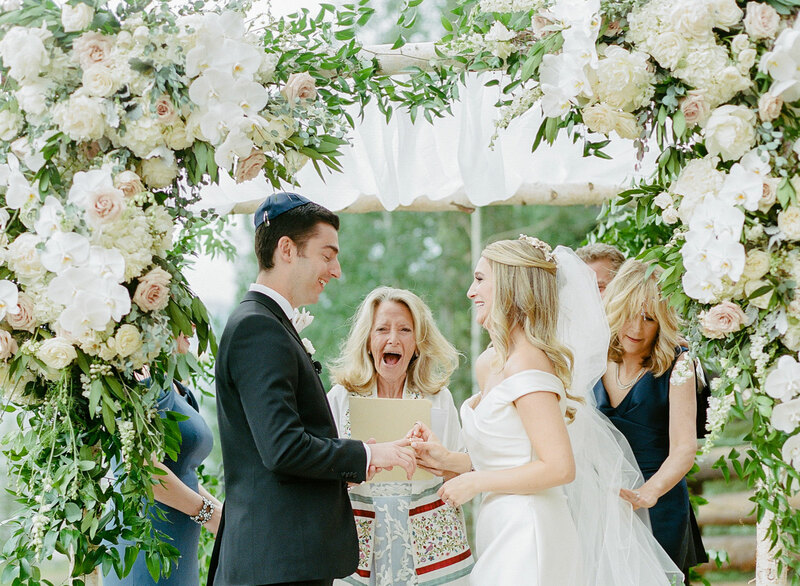 In Jewish tradition the groom broke a glass at the end of the ceremony, but instead of smashing it, it rolled away twice, creating a great comedic moment, which the bride and groom embraced. 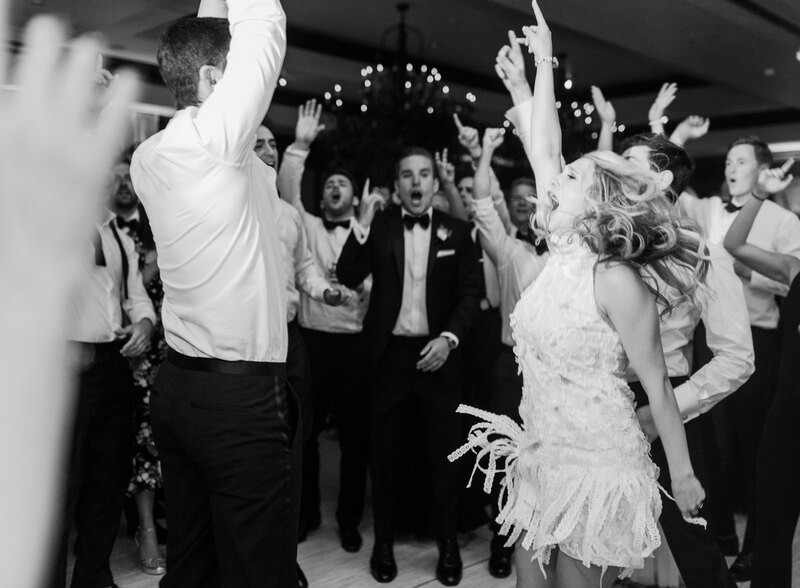 The bride and groom wanted to keep the mood of the ceremony light and playful like them and had their wedding party walk down the aisle to two of their favorite musicals- Hamilton and Phantom of the Opera. 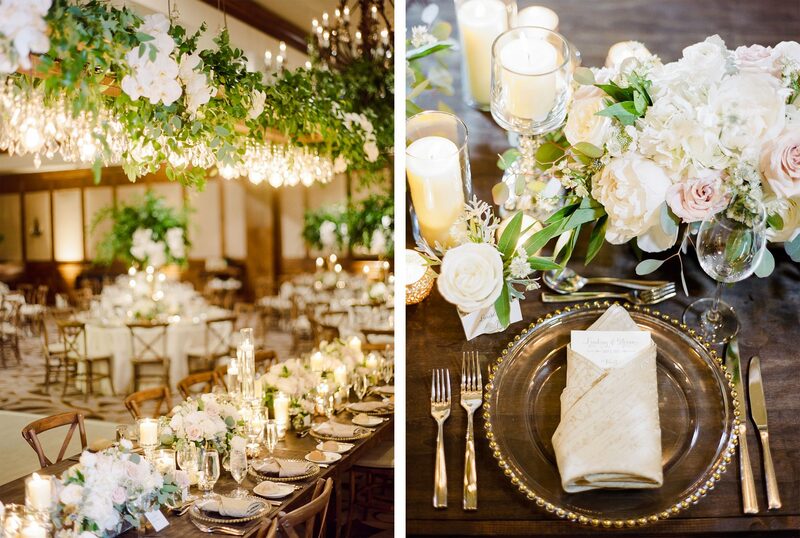 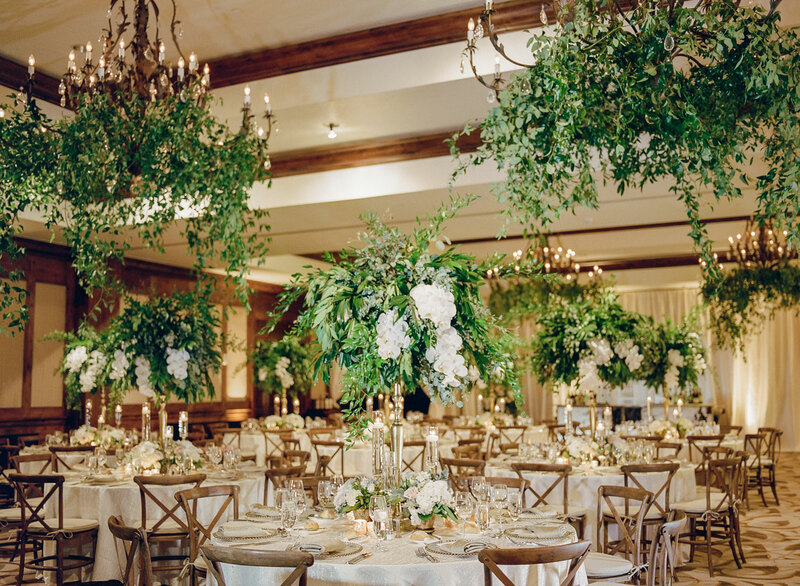 Vail Vintage Magnolia transformed the ballroom with a mix of high and low centerpieces, a large chandelier installation over the head table and lush greenery hanging from the chandeliers. 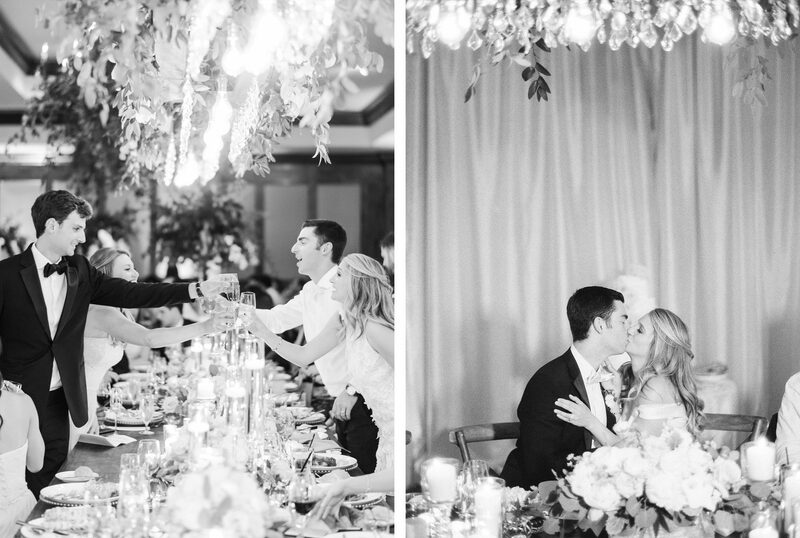 The couple wanted the ballroom to be unrecognizable, but also wanted guests to still be able to talk to each other over the tale so created installations at two levels to not block any conversation. 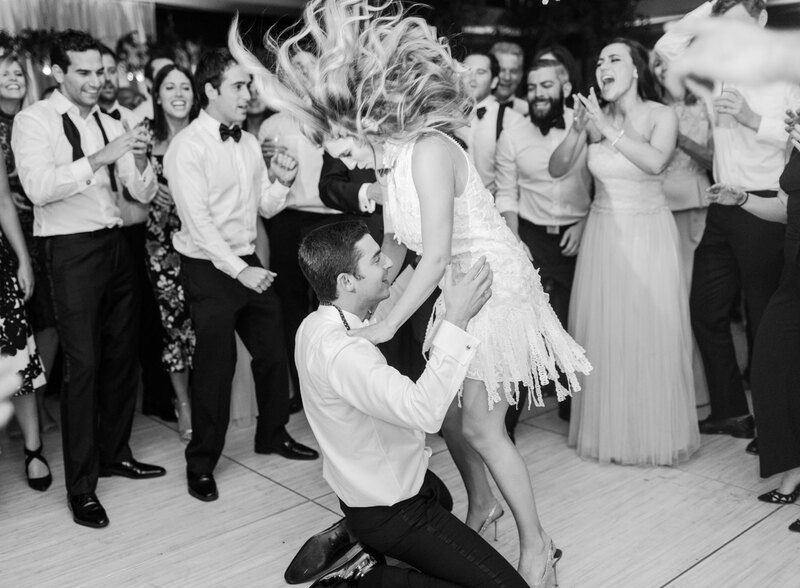 After they cut the cake the bride changed into a tasseled short party dress to dance the night away in. 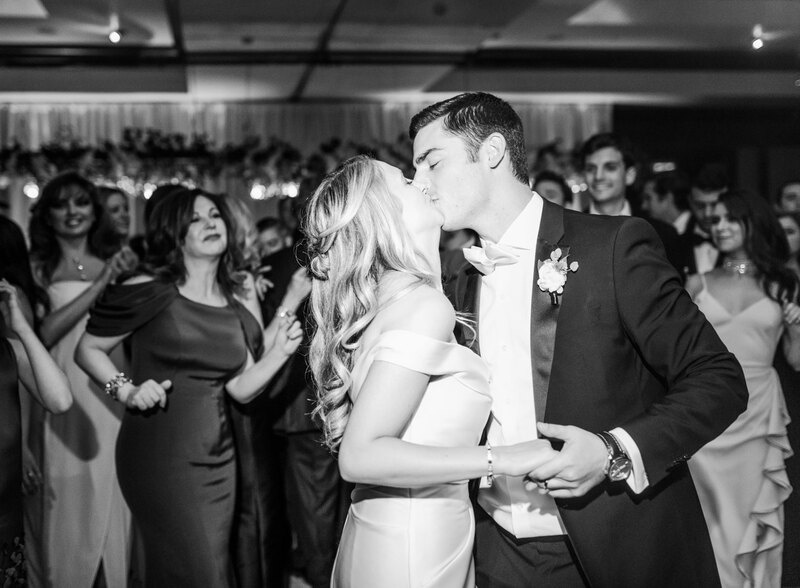 The weekend came to a close with a fireworks celebration back on the bridge where the couple said their I Do’s.